Christmas! I really can't stand it, but this anthology appealed to me for the following reasons. 1. The killer cover! (For which I got to host the exclusive cover reveal on my blog, Char's Horror Corner, and it was very exciting!) 2. It was edited by Christopher Golden and I've had good luck with anthologies he's edited in the past. I'm happy to report this one was no exception! Most anthologies are hit and miss with me-very rarely do all the stories hit their mark. In this case, though, it was pretty close to doing so, therefore I gave it a four star rating overall . 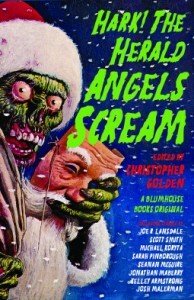 Even if you hate Christmas, and you "Bah Humbug" with the best of them, this anthology has something for everyone-the variety is outstanding. So as the title suggests HARK people! Come and hear the angels scream!